* help you organise your restaurant bookings for the other three nights. * do our best to indulge you in whatever activity you wish. On your first night, while sharing a meal with us, we'll chat with you to discover your interests, and help you decide what you'd like to do during your stay. We can arrange for each of you to do different activities according to your individual tastes. Introducing the Lazzeri Family - Rosalinda and Stefano (and little Virginia), and Lilla and Fedora (Rosalinda's Mother and Grandmother). For the past twelve years they have been providing amazing holiday accommodation in eastern Tuscany, and during all those years they have often assisted Geoff and Pat Thomas of Tuscan Sun with accommodation and some occasional driving. Well time has taken its toll, and the Thomas's have retired now. The Lazzeri's so enjoyed the company of Geoff and Pat's many guests that they themselves are inviting up to five or six guests to join them, for a week or two at a time, to live in and tour these fantastic regions. Not only will they continue to offer a similar program, but they're enhancing it by offering it year round, and with the added interest of enjoying an Italian family experience and genuine Tuscan Cuisine! Pat will often be in the area during the summer and are looking forward to catching up with you. All the activities and touring destinations remain unchanged, and Rosalinda will be your touring leader. Additionally, as an optional extra, Rosalinda and Lilla can introduce you to the art of Traditional Tuscan Cooking, with the preparation of the evening meal for one of the "eat in" nights. Talk to Rosalinda about it when you arrive! In 2018, between March until Mid-October you will be staying in Tuscany in a beautifully appointed villa which overlooks the fabulous Val di Chiana. It is situated near the ancient Village and Castle of Montecchio, and surrounded by olive groves and vineyards. If you'd like to stay at other times of the year, don't hesitate to inquire. You can find out more about our accommodation in Tuscany at La Maestá by clicking here. Montecchio is about ten minutes by car from both Camucia and the more famous hilltop town of Cortona in the south, and a similar distance from Castiglion Fiorentino to the North. 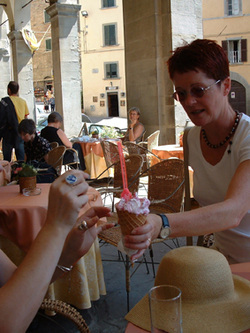 Those of you who have read Frances Mayes' "Under The Tuscan Sun", or have seen the film, will already know all about Cortona, and the fact that it probably warrants a week in itself! The railway station is at Castiglion Fiorentino, and can be reached directly from Rome, and also, with only one change of train, from Milan and Pisa, both of which have international airports. Rosalinda will pick you up from this station, or if you are driving, just ask for comprehensive instructions for reaching her. 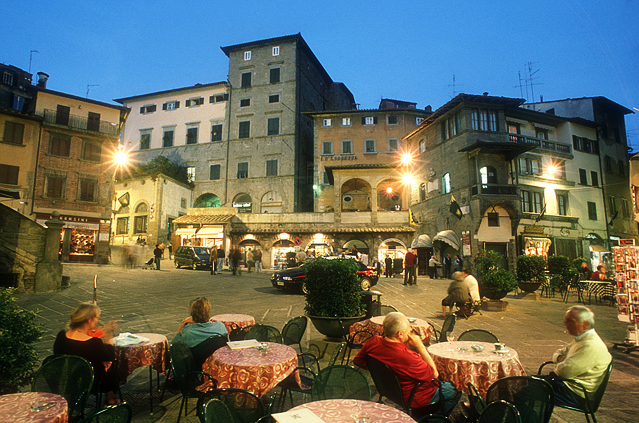 Above: Cortona in the evening. It really is a beautiful medieval town. While you are staying with us most of your evening meals, and of course, all your breakfasts, will be provided, but on four evenings we will eat out with the locals! 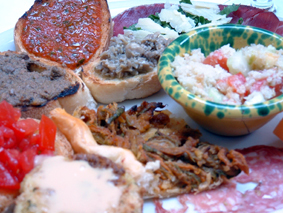 The venues range from pizzerias through trattorias to very good restaurants. Above: Some amazing food - Cortona. On three days during the week, we set off at a civilised hour in the morning to go to destinations selected by yourselves from many within the range of an hour and a half's drive. 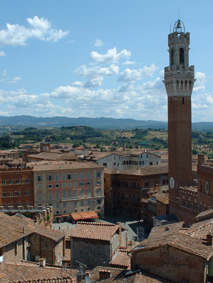 Mostly these are places in which one can comfortably spend the entire day, such as Siena, Assisi, Perugia, San Gimignano and the Chianti region. 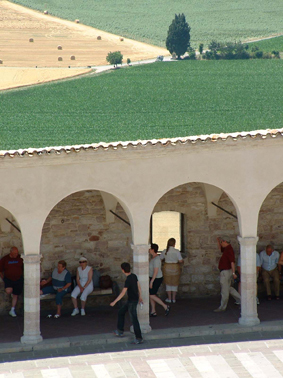 If you're looking for something a little different, we often visit the breathtaking Frasassi Caves in the Marches region, the Roman baths at Bagno Vignoni, the funevia at fascinating Gubbio, the Abbey at Monte Oliveto Maggiore, Todi and Orvieto, the wine towns of Montepulciano and Montalcino, and many other interesting places. On the other days we spend our time closer to home, at the weekly market at Camucia, or exploring Cortona, Castiglion Fiorentino or Passignano or driving around Lake Trasimeno, or sometimes out walking or painting. Many of our guests have been keen walkers and we have picked them up at prearranged spots quite some distance from home. We will try to enable you to indulge in whatever activity you wish, and you can tell us all about your day, and swap stories with your fellow guests, around the table in the evening. In short, we want you to enjoy yourself in this piece of paradise, and will do all in our power to help you.